Old Redding kitchen and fireplace. Photo courtesy of Plymouth Quarries. 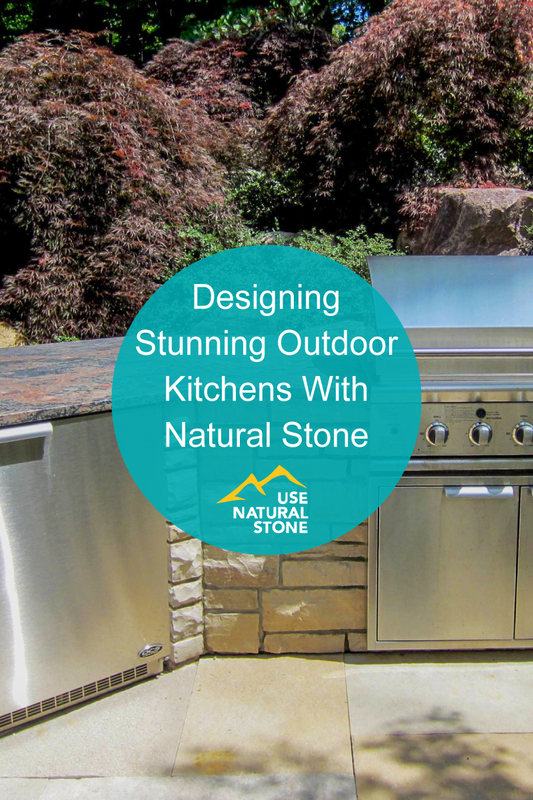 Many homeowners get inspired by stunning outdoor kitchens that incorporate beautiful natural stone and luxury appliances they see on social media sites like Pinterest or in print magazines. Those ideas are great because they help landscape architects and designers better understand what their clients love and can hone in on a certain look. They also serve as a point of reference and allow them to suggest ways to tailor the design to their respective climates since what works in Palm Springs or Scottsdale won’t always work in Chicago, according to Scott Byron, founder and CEO of Scott Byron and Company, a Chicagoland-based landscape architecture design, build, and maintenance company. 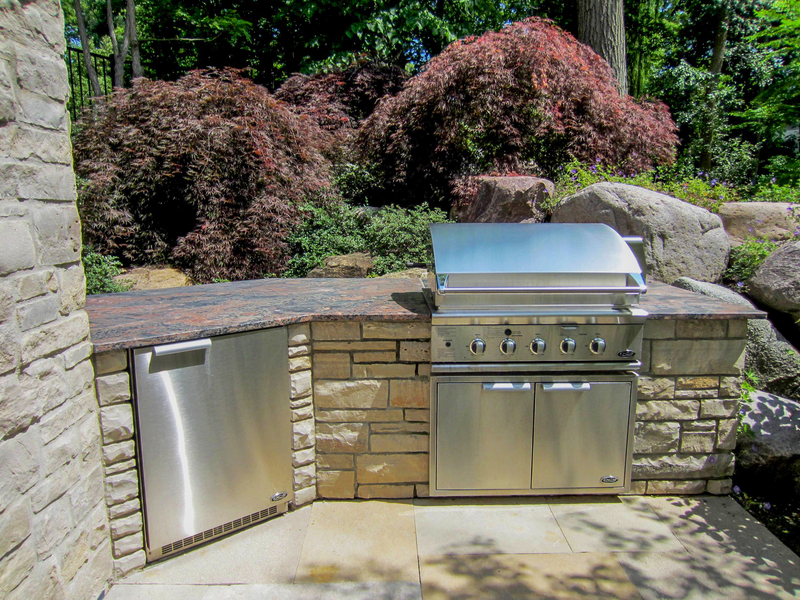 Different climates often dictate how the outdoor kitchens are used. As a result, landscape architects in the Midwest tend to be more focused on designs that accommodate the realities of harsh winters than those in warmer climates, who can take advantage of building more of a total outdoor environment. Pizza oven. Photo courtesy of Plymouth Quarries. The beauty of natural stone is that there are many options, regardless of where one resides. Since there are so many natural stone options when it comes to outdoor kitchens, Byron recommends homeowners narrow it down to those most appropriate for both the space and the environment. 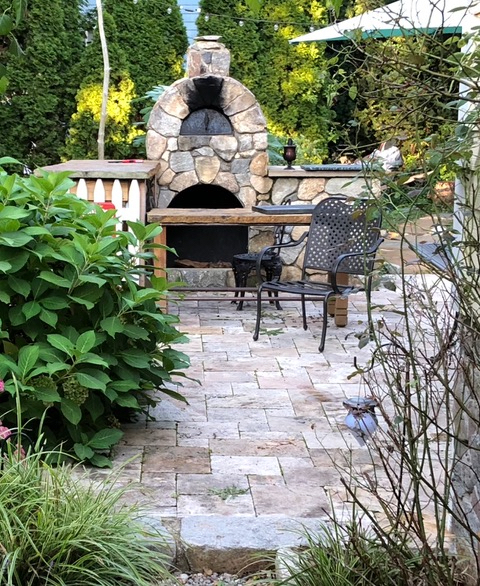 For example, he suggests using the same stone in the terrace or the garden as part of the outdoor kitchen to create a more unified and welcoming space. A nonporous stone needs to be used for the countertop. Byron likes to use honed granite because it tends to withstand the elements really well, no matter where the home is located on the country’s map. Honed granite also comes in several colors, making it easier to choose a hue that matches a homeowner’s color preferences. 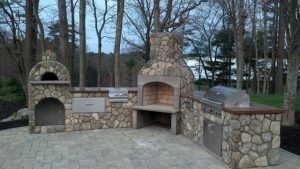 Byron recommends installing the outdoor kitchen in a shadier area as that will help shield the stone from the elements. 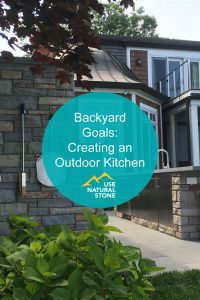 “The most important thing is to learn how the outdoor kitchen is going to be used, how the family will interact with it, what the family is doing, and then design to their needs,” says Byron. Outdoor kitchen. Photo courtesy of Scott Byron. “If you are a winter BBQer, being close to the back door is really important so you can run in and run out,” he notes. 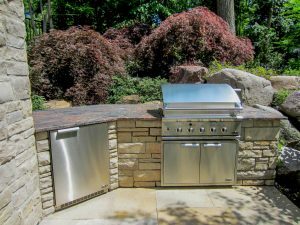 “If you’re really a summer entertainer, it’s important to design the space around the entertainment with the kitchen being part of the space.” Byron notes that some communities have strict regulations about the location of outdoor kitchens. He recommends checking with your local municipality before making any decisions. Extreme weather must also be considered when using natural stone in the design. In some northern climates, for example, there is a fair number of months where the frozen snow will remain for long periods and then suddenly thaw when the thermometer rises above freezing. The expansion and contraction caused by these freeze thaw cycles are difficult on masonry and natural stone, according to Dean Marsico, head of Executive Sales and Marketing for Plymouth Quarries. 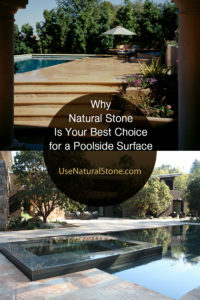 A professional can help guide a homeowner on what types of natural stones are best suited for their particular climate conditions. 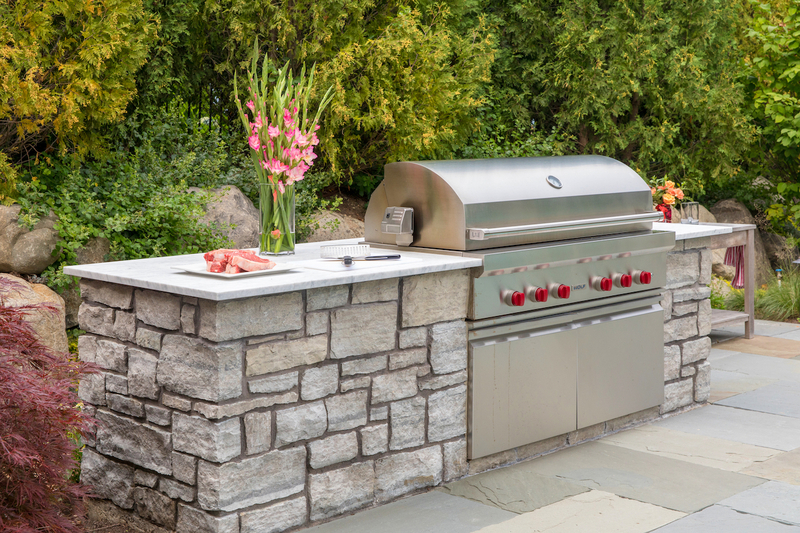 Outdoor grill with boulders. Photo courtesy of Scott Byron. 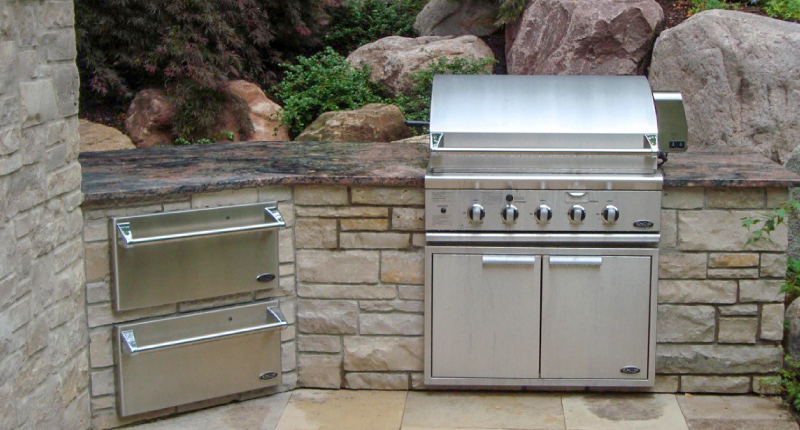 One of the biggest trends in outdoor kitchens is that people are actually using them, laughs Byron. Before, outdoor kitchens used to be more of a showpiece. Now, as people crave more time with their family and friends and less time plugged into their electronics, an outdoor kitchen is a great excuse to get the grill going and enjoy the outdoors. Built in barbecue and fridge with granite countertops. Photo courtesy of Scott Byron. Start with a basic internet search and look for the top suppliers in your area and go to the supply stone. 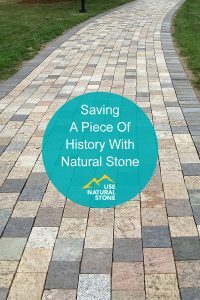 Begin by educating yourself on natural stone and ask the representatives what types of stone would work well in your climate and your design interests. Once you begin to see a pattern emerge from the answers, ask the suppliers for their list of referrals. Then be prepared to do some research and call on a referral’s past clients. Are they pleased with the work? Finally, once you find your natural stone soul mate, realize you might have to wait. The business is so busy right now that it’s not unusual that the best people are already booked. Natural stone makes the space feel calm, inviting, and warm, notes Byron. 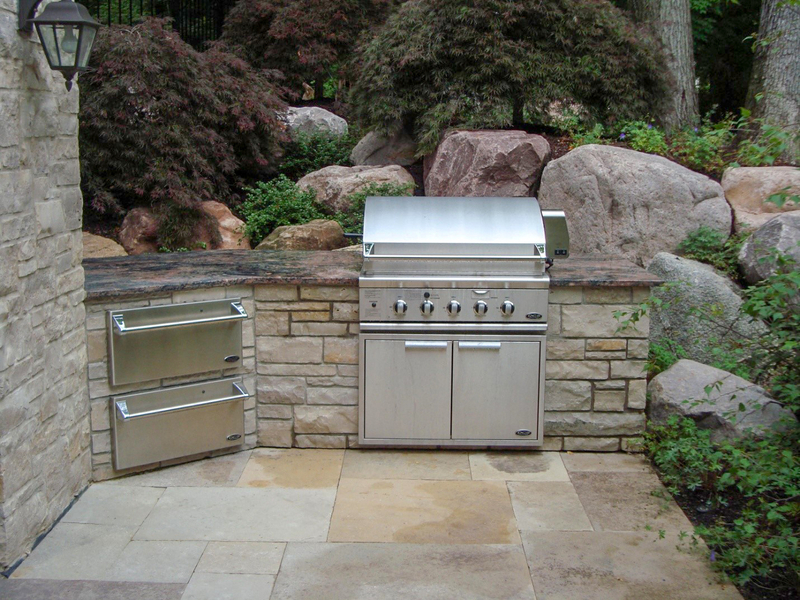 At outdoor kitchen can be a real centerpiece in a home’s overall design, not just the outdoor portion. Working with a professional can help guide you in making the best decisions so you and your family and friends can enjoy outdoor entertaining for years to come.